We are participating in RoboCup, the robot world cup football, and the goal of Robocup is to build a team of humanoid robots that can beat the team of human world champions by the year of 2050. Along the way we are building smaller systems. There are different leagues in RoboCup, in our league (SPL) we use a standard platform, the NAO robot of Aldebaran Robotics. We have been in this league for 3 years and have become world champion twice. 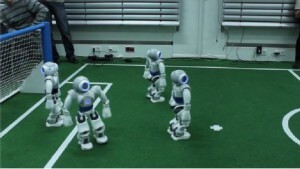 To make robots play soccer we distinguish between 4 different levels in our system. The first one is perception. There, we try to determine what the robot currently sees in the world, such as the goals, the field lines, the ball and other robots. 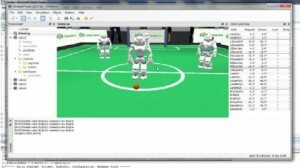 In the second stage the robot builds models from this information, for example to determine where it is located on the game field, where the ball is, and where the other robots are, but also how fast is the ball, for the goal keeper to decide when to dive for the ball. The third one is behavior control that uses this information to make decisions: when to walk, when to kick, when to stand up. The fourth one is motion control, where these decisions are executed. Currently about 20 people are working with NAOs. In our team B-Human we have 17 students: some of them are working in the main studies with NAOs in project for their diploma thesis. We also have PhD students 2 senior researchers who work with NAOs. We are programming the NAOs in C++. We have developed the software tools by ourselves including a simulator. We only use the device control of NAO. We have developed our own walk, our own vision system, because since we do research in all these areas it’s interesting for us to develop all these tools by ourselves so we can make serious progress in these areas. In the past years we have increased the walking speed a lot. In 2009 we started at 14 cm per second. Last year we increased to 28 cm per second. This year we might be a little bit faster than that. We also have worked a lot on team cooperation. That’s the big challenge of this year because the size of the team is increased from 3 robots to 4 robots so coordination comes more important, and we are already working on that. Our expectation is to continue with becoming world champion.